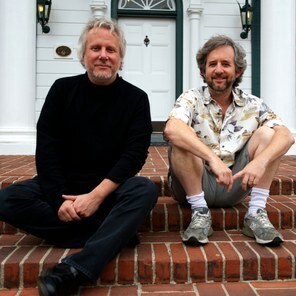 Larry Karaszewski and Scott Alexander started off with a huge success (1990’s PROBLEM CHILD) that left them dissatisfied, so they decided to reboot their career. They have found a niche in writing biopics of odd, strange, alienated public figures such as cult filmmaker Ed Wood, pornographer Larry Flynt and funnyman Andy Kaufman, and lacing them with poignant drama, quirky humour and insightful characterisations. 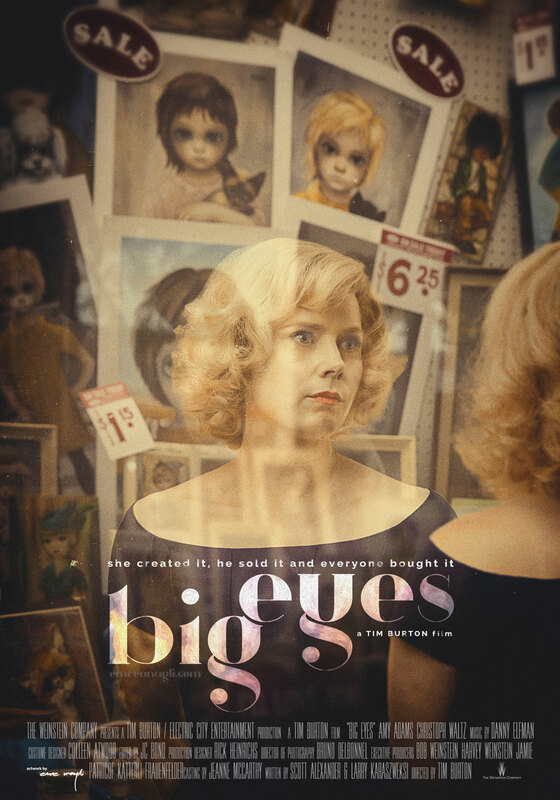 I talked with Larry and Scott about their latest biopic, BIG EYES (2014), which tells the strange-but-true tale of the Keanes, the people behind 'Big-Eyed Art'. Can you remember the moment when you realised that the Keane story would make a good movie? (Scott) We were working on a science fiction movie that was about pop culture from Planet Earth finding its way across the galaxy to a planet of higher intelligence, and our pop culture destroys the planet. We were looking for funny examples of weird kitsch and forgotten pieces from the pop culture landscape. My wife had this book called The Encyclopedia of Bad Taste (1991), and I brought it into the office just to flip through and giggle at. There were two pages on the Keanes, and it kind of blew my mind what an amazing story it was and how I knew nothing about it. I showed it to Larry and he was familiar with the story. We are always stumbling across oddball stories and pieces of history but we rarely pursue them. It's not often we say ''Oh, that could be a movie.'' A lot of the times we'll find something crazy and joke about it for twenty minutes and then say ''Well, never mind'', and them throw it into the trash. This one kind of stuck with us. (Larry) Usually these things, even if they're great, or a perfect piece of pop culture, you sort of ask ''Well, what's the movie?'' The thing about the Keane story was that even after doing very little research you could see it as a film with a three-act structure. The trial was so ridiculous and so definitive that you could instantly see it as the third act. You always have to ask ''What is going to be the arc of the movie? 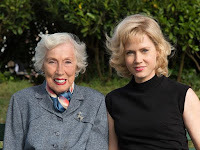 '', and Margaret's life provided that for us. What happened after that was that Scott was so excited that I contacted a friend of mine, a rock 'n roller who was big in the '90s named Matthew Sweet. 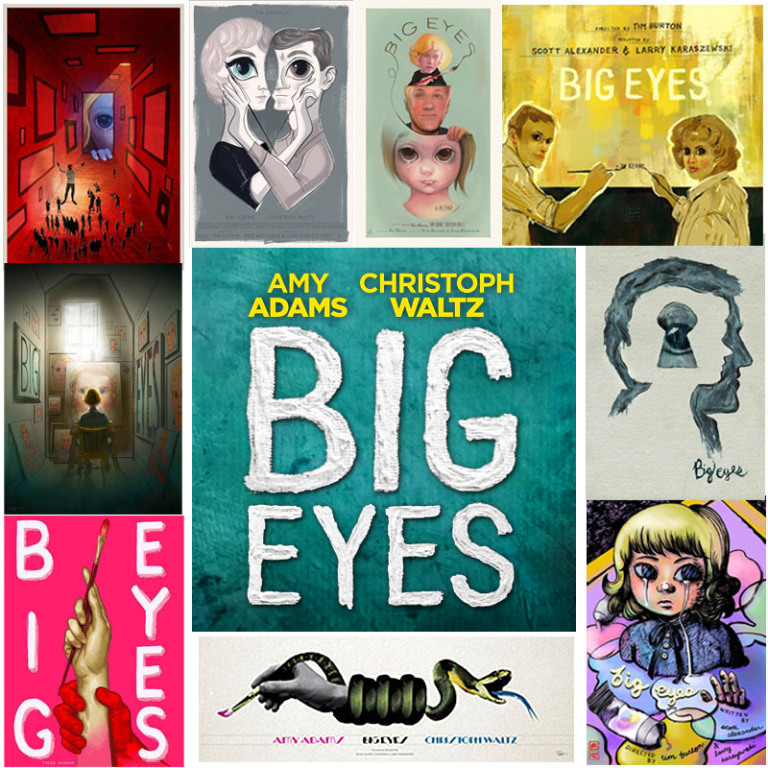 He happened to be a fan of Big Eyed art. 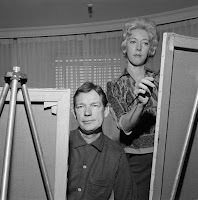 In the early days of the Internet he discovered Margaret's paintings and started bidding on knock-offs of them on Ebay. He kind of cornered the market on Margaret's art. He had all this research material and all these paintings we could look at, and he walked us through the history of Margaret's art. He also put us in touch with Margaret's gallery. We had a one-stop expert on our team, who was also a lot of fun to hang out with. We actually did a lot of research before we contacted Margaret. We didn't want to contact her until we had our stuff down and until we knew that this was something that we wanted to do. You don't want to get the real people involved excited, and then decide not to do it, particularly because we were going to do this independently. We were not looking to set this up at a studio, so we really needed to convince ourselves that we were ready to take the leap. When we met Margaret we wanted to let her know that we knew the story and that we weren't slick guys from Hollywood coming in to try and win her over. Why did you want to make this independently and not at a studio? (Scott) We started this project in 2003. We had just sunk a lot of time into two biopics at studios that had not gotten made. One was on the life of The Marx Brothers, which was a story very near and dear to us. A couple of years went into that project. We'd also written a completely crazy script which was based on Driving Mr. Albert, which is the true story about the Assistant Pathologist in New Jersey who stole Albert Einstein's brain after his autopsy. The Marx Brothers script was as down the middle as a biopic script as we'd ever written, but the Einstein script was extremely eccentric. Both of them were written for major studios and sort of lost their way and did not get made. They were both clearly kind of doomed. These situations are really frustrating because the biopics require so much more time than a regular screenplay. Most Hollywood screenwriters can bang out a first draft in maybe twelve weeks. We might spend a year on a biopic writing the first draft. We might spend six months just researching, interviewing people and reading as much as we can find. We really enjoy that but the time invested is crazy. I think we were just feeling really demoralised that those two projects had not gotten made. We were planning on directing The Marx Brothers, but there was just no cheap version of the project. There were five brothers, and in vaudeville you are in a different theatre every week, and then you're on a train. Trains are expensive. And then you're in New York or recreating Hollywood in the 1930s. It was so big. When we decided the Keane story could work as a movie, we thought maybe we should try to do it completely differently. We thought ''We can get a great actress and a great actor, not a lot of actors, we can keep it contained. We can probably make this one ourselves.'' The plan seemed kind of foolproof at the time. What was the biggest challenge of writing the script? 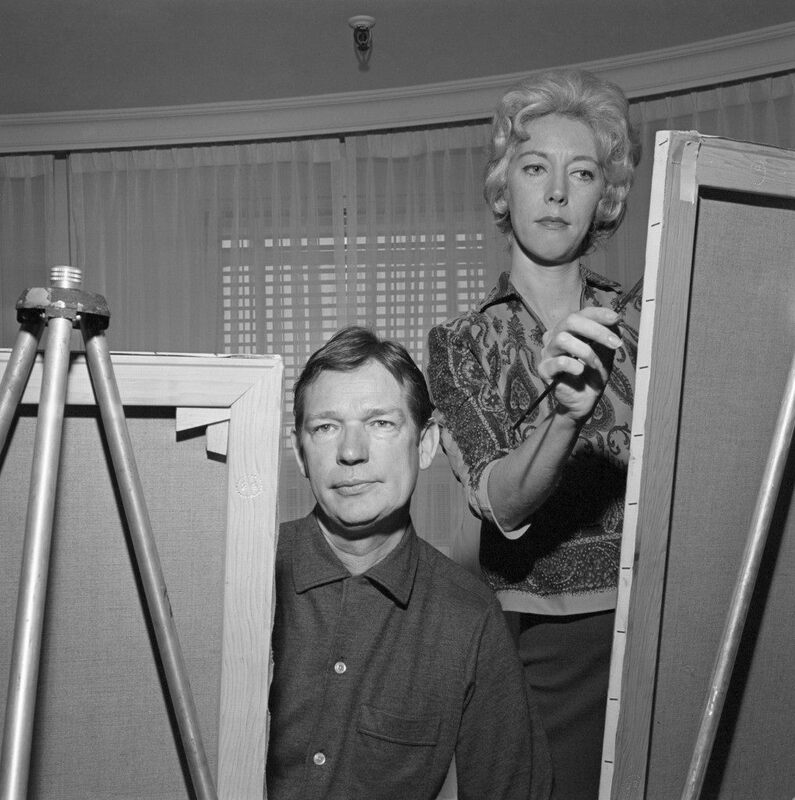 (Larry) The biggest challenge was capturing Margaret Keane. There was the interesting challenge of tackling a woman's story, which we had never done before. 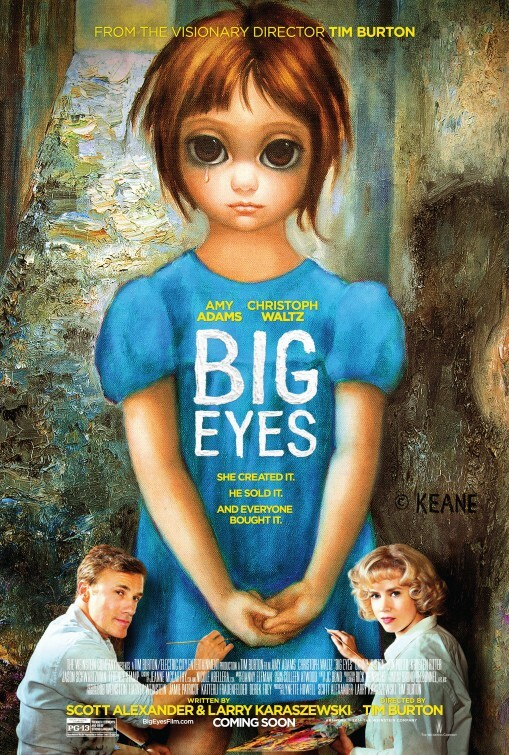 She is also an unusual protagonist in that Walter Keane is the one who runs the plot, and he's also the antagonist. It was the first time we had done a movie where the leading guy was also the antagonist. Walter is the more traditional character, the one who has got a dream and a vision, has passion and has to sell the hell out of his ideas. People think he's wrong and he is going to prove them wrong. He's out there accomplishing things and holding court, and being the centre of attention, but Margaret is the artist. The toughest part of the script, but also what made it interesting and a very special movie, is that the centre of the film is a quiet person. A lot of the movie is just watching Margaret think, digest and take things in. She's not overselling it. It goes against everything that you are supposed to learn in screenwriting books, but for us it was like tying our hands behind our backs and creating a really interesting character and an interesting antagonist for her to battle, so that when Margaret stands up to Walter it really means something. We also wanted to be very true to the time period in that this is what a lot of women went through. From the 1950s to the 1970s, women started in one place, where it was 'stand behind your man and do what your husband tells you' and by the end, even if they didn't consider themselves feminists or as political in any way, they saw that they should have their own voice. We took that as something that was already there that we could place on top of the Margaret Keane story. The film balances many different tones really well. Were the different tones something that really concerned you when you were writing the script? (Scott) We enjoy mixing comedy and tragedy and weirdness and truth and detail. It's always the hope that it adds up to a coherent piece! (Larry) That's the fun part for us, when we realise that a piece has all these elements. 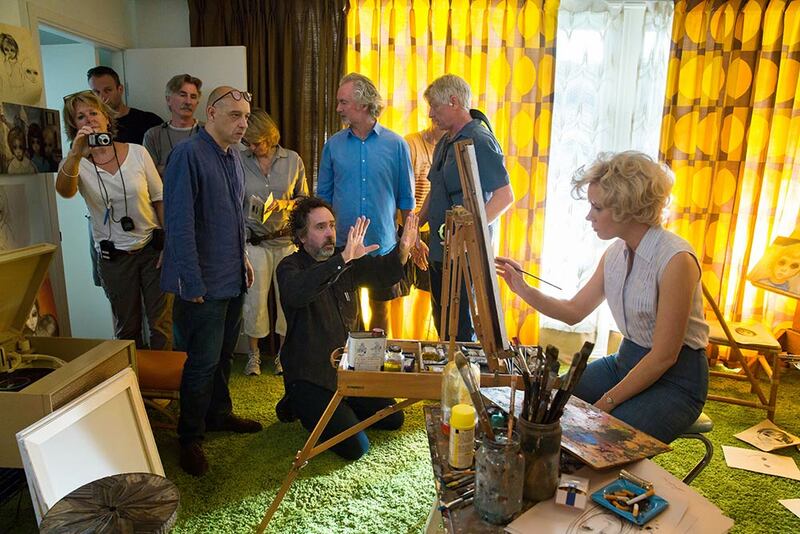 We have been lucky that we've had directors like Tim Burton and Milos Forman who 'get' where we are coming from. They're not afraid to mix up different elements or throw a joke into the middle of a serious scene. Were there other reasons you were attracted to the story? (Larry) We liked the way it paralleled the female empowerment movement in the country. We also loved the conversation about 'high art' vs 'low art'. Also 'What is art? ', which is a question that ED WOOD (1994) also addressed. We also loved the idea of the outsiders charging against the gatekeepers of society. It had a lot of themes and issues that we are always drawn to. We felt it was a challenging, interesting story. I think the thing we loved the most about it was that it was a story that you think you kind of know already. 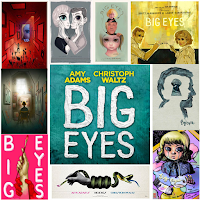 You see the 'big eyes' paintings and you say, 'Oh yeah, those things.' They're quite famous paintings but nobody knows the story behind them. It's the same with Larry Flynt. Everyone knows Hustler magazine and has an opinion on it. But you didn't know the story of the guy behind the scenes. Everyone knew that Andy Kaufman was the weird guy from 'Taxi', but you didn't know how he began, and how he reinvented himself as a performance artist, and made comedy that wasn't funny. There's all these interesting things that go on behind the scenes. We're writing a television series right now based on the O.J. Simpson trial, and what's interesting is that everyone comes to that with their pre-set notion of what happened and what sort of characters everyone were. What's been great about having ten hours to explore is that you find that everything that you thought you knew about these people gets flipped because there's another side. 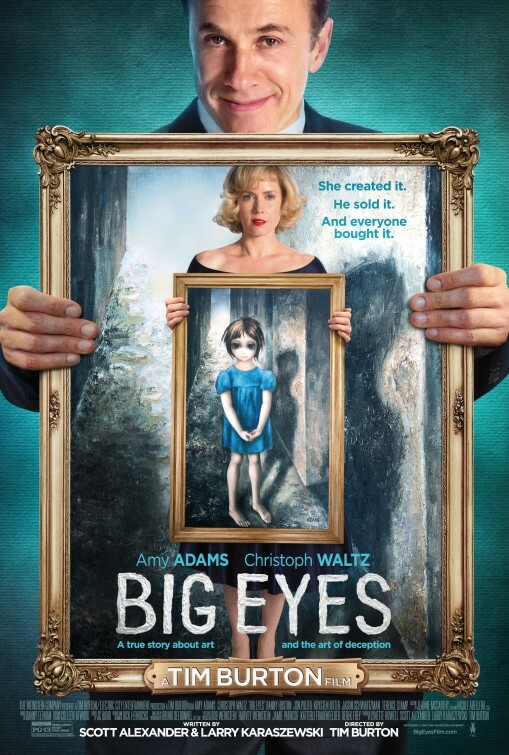 Did the BIG EYES script get a lot of attention immediately? (Scott) It got interest, but if it had been an easy road, we would have had this conversation with you ten years ago! We never sold the script but our enthusiasm was kept going by the actors and actresses willing to play the parts, as well as amazing cinematographers, production designers, costumers and editors who were willing to work on the movie. We had all these option deals. We kept thinking 'Oh, we're about to shoot the movie in New Orleans, we're about to shoot the movie in Buenos Aires.' We always had all these different versions, and then something terrible would happen. Fortunately, the script would always come back free and clear to Larry and I because we always negotiated a deal that the rights would revert back to us if it didn't start shooting by a certain date. There's this deal you make with the devil in Hollywood where if you sell or option your material then that person who gives you money has a right to it, which is only fair since they gave you money. At the end of the day, we never got paid. It was always us paying for stuff. (Larry) The problem with that is that it never ended, and we kind of killed our career in the past ten years because we so believed in this movie that we continuously tried to see how we could get it made and get into pre-production. The project would fall apart and instead of writing a script or taking another job, a week later we would look at other actresses or take another lunch. We were in this hamster wheel of pre-production that would never get out of a certain gear. After a certain point in time, we looked at each other and realised that this movie had to get made. For one thing, Margaret wasn't getting any younger. 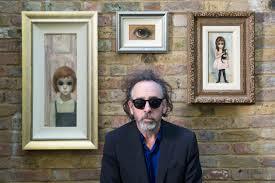 Up until that time Tim Burton had been a producer on the film and we approached him about swapping places with us and directing the film while we produce. Tim was at a place in his career where he really wanted to make a smaller film, and it seemed that he could really get the film made. Once he said yes, it came together really quickly. We're very happy we made that decision because we're very proud with the movie that got made, and now we can go on and create some other things. Was it just bad luck that none of the other versions got made? (Larry) We put it together one time and the financial crash happened, and the money guy fell out. Another time a lead actress got pregnant and dropped out, and we lost the lead actor slot because he couldn't wait for another lead actress. Once a project falls apart a couple of times, it starts to smell a little bit. People start wondering ''Well, why isn't this movie getting made?'' Even though we had people willing to sign up, investors started thinking ''We will put some money in, but maybe we shouldn't invest as much.'' It became harder to put together as time went on. With various leads attached over the years, did the script change much? (Larry) A lot of times scripts change over the years because in development, unless you're changing the screenplay people feel like nothing is happening or something is dead. With a movie at a studio, people are rewriting the script or hiring other writers not because it is getting better but because it has to have some forward momentum or it dies. Because we were making the movie for ourselves, we didn't need that. Do you think the script improved with the extra time that you had? (Larry) It got more boiled down which is kind of cool. We get all of our ideas out of the way in the first draft. Our first drafts tend to be 180 pages and then we cut it down. When we go through it we really write down every possible thing that we want to so that the cream rises to the top when we cut out the stuff that we don't need. What's interesting is that when Tim got on board, we thought Tim might get more money to make the movie so we actually went back and threw a lot of that stuff back into the script to show him. It was a version of the script that had all the intros and outros back in the movie. Tim looked at it and was like ''No, no. I like the cut down version, the two-hander version.'' He was into the idea of making a lower-budget movie and something that was out of his comfort zone. Is it true that Christoph Waltz was hugely interested in the project and was a big part in kickstarting the production? (Larry) What happened was that Christoph was in L.A. for the Oscars because he had been nominated for DJANGO UNCHAINED (2012), and his agents were trying to drum up work for him while he was in town. One of his junior agents thought he'd make a good Walter Keane and there was some interest from Christoph, which sparked us. We mentioned it to Tim and he got excited about it. We could see the wheels turning in his mind. Tim volunteered to go and meet with Christoph to try and convince him to do the movie. So we kind of pulled Tim aside and said ''If you want to direct the movie now, we'll step aside. But please don't say this to anybody else. We're not looking for another director to take over, but you're someone we trust because of the whole experience with ED WOOD. We have total confidence in you that you'll knock this out of the park.'' Tim said yes, he met with Christoph, and it all came together really quick. It had been a while since ED WOOD. Did you find your dynamic with Tim had changed at all? (Larry) We're all a lot older! We remained close to Tim throughout the years and there were several projects that almost got made. We did a lot of work on MARS ATTACKS!. We did work on Tim's Ripley's Believe it or Not movie which got cast and almost to the starting line before unfortunately the plug got pulled. We also wrote an animated Addams Family project for him. So it wasn't like twenty years had gone and we were suddenly shaking hands again. We had been working on quite a few projects with him. It just seemed that it was the time to do one of our kind of movies together, which is nice. 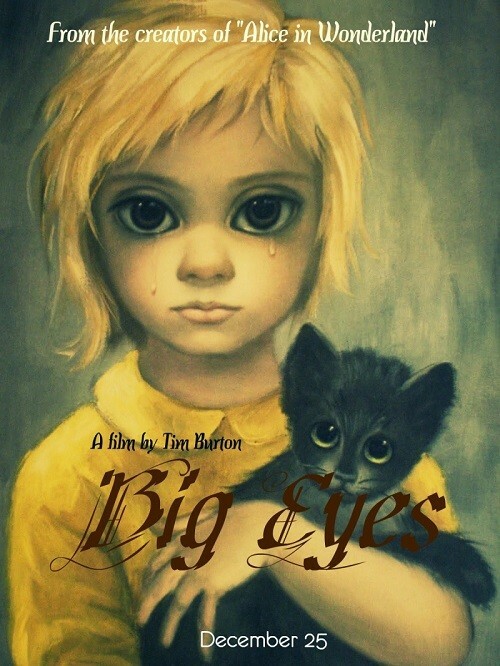 ED WOOD and BIG EYES really stand apart in Tim's filmography. They're based on real people, so they're a lot more grounded. ED WOOD is different in that the real-life characters are so odd, with Gothic characters that are more in the Tim Burton wheelhouse, but it's still somewhat based in reality, and Margaret's story is easily the most hearfelt and real-life story that Tim has ever come close to. When did Amy Adams come on board? (Scott) It literally all happpened within a week. Tim met with Christoph, pitched him, Christoph got excited. The next week they were both in LA for the Oscars, and Christoph read the script and told Tim he would do it. Tim and us got together and talked about who we wanted for Margaret, ands we all wanted Amy. Amy heard about this and she wrote Tim a fan letter that night. She had read the script already and wanted to play the part because she identified with the character. Tim said yes, Harvey Weinstein heard about it and was happy, and three weeks later we had financing, a director and the two stars. It was an overnight success after ten years! Christoph's performance is very 'big'. Was it always the intention to have such a big performance? (Scott) Walter is this character who is very happy standing on a soapbox with a cluster of microphones in front of him, talking about himsef for an hour. Walter did so many unbelievable things, and he was so crazy and self-indulgent in his interviews. He is constantly referring to himself in the third person. There was a ridiculous bigness to the real Walter, which we found sort of endearing. (Larry) It blows people's minds to learn that the trial was pretty close to the facts. The real Walter Keane DID cross-examine himself. A lot of his lines and outbursts are taken from court transcripts and newspaper reports. For better or worse, Walter was bigger than life. The reviews seem to indicate that it's a film that is a different experience for each person who sees it. Would you agree with that? (Scott) We had a lot of test screenings. Then the film was locked and we had a lot of media screenings. We've never had a film quite like it. It played differently every time. I kept getting frustrated in test screenings thinking ''Why are they not laughing at this joke? I think this movie is hilarious!'' And then at our first official media screening at the LA County Museum of Art, it just played through the roof. The crowd was just screaming with laughter for an hour and forty minutes. We thought ''Finally! Someone gets it!'' The first bunch of reviews came out of that screening saying ''This movie is a riot! What a romp!'' or ''This is a good-time, fascinating slice of midcentury America.'' Two days later we had another screening and no-one made a sound. We thought ''What is happening here?'' Usually when you make movies they end up being a bit of a machine. For example, I know that if I ever showed up to a revival house showing MAN ON THE MOON (1999), even after all these years, once Tony walks onstage and says that opening line to George, the audience is going to laugh. It's a well-oiled machine. But this movie is a very subjective experience. (Larry) It touches people differently. It also seems to play better to older audiences and to female audiences. We got some very good reviews and of course Amy won a Golden Globe for Best Actress. Some of the audiences thought they were coming into a typical Tim Burton movie, and some couldn't understand why Margaret would stay with Walter in the story. (Scott) I think men asked that question a lot more than the women did. Many might think that at times you are following Hollywood conventions or being deliberately odd, but you're actually just telling the real-life story. (Scott) Margaret's story is completely bizarre. But we saw her as emblematic of a certain kind of woman at a certain point of time in American history. The fact that she stuck with Walter did not strike us as science fiction. (Larry) It's like with my own mom. My mother was married to my father for twenty years. He didn't beat her but it was emotional abuse and it wasn't a pleasant place to be. She stuck with him because she was a good Catholic girl and Catholics didn't divorce. It was again a certain time period, and she lived an unhappy life for decades, until around the same time as Margaret did, she decided she couldn't take it anymore and loaded us in the back of the car in the middle of the night. We were trying to paint an honest portrait of women in that time period, and some people just didn't get it. What is the story behind your prominent writing credit on the posters? (Scott) It's a very simple thing. The Writer's Guild rules that the writer's name has to be the same size as anyone on the movie, except the actors. (Larry) I don't think people would notice it so much if my surname wasn't so damn long! It eats up a lot of the poster. (Scott) This also happened to us on another Weinstein film, 1408 (2007). Stephen King had been licensing his books for like two or three hundred years. He writes a new book like every week, so there were all these movies made from his movies. But he wasn't very happy with a lot of them. He said to us ''You know, this one is really good.'' The studio asked him if they could put his name on the poster as 'From Stephen King', and he said yes, which was a big deal, and we were very proud that he felt good about the movie. But as soon as his name went on the poster, it triggered the Writer's Guild clause. Having our names on the poster in bigger size triggered a Director's Guild clause, so suddenly you had all these names insanely huge at the bottom of the poster, all the same size as Stephen King, because he wasn't an actor in the film. How happy are you with the final film? (Scott) We're very proud of it. (Larry) It's another one of our movies. It's a very interesting, unusual piece. The two lead performances are great, and I think Tim did an amazing job. It looks beautiful too. I spoke to Scott and Larry on 14th February 2015 and would like to thank them for their time.